George Harrison's first original song was written on tour in August 1963. Don't Bother Me I wrote in a hotel in Bournemouth, where we were playing a summer season in 1963, as an exercise to see if I could write a song. I was sick in bed. The song was not highly regarded either by Harrison or the other Beatles. I don't think it's a particularly good song; it mightn't be a song at all. But at least it showed me that all I needed to do was keep on writing and maybe eventually I would write something good. I still feel now: I wish I could write something good. It's relativity. It did, however, provide me with an occupation. Don't Bother Me was meant as a plea for privacy, and the tone of the lyrics is reflected in the downbeat music. The Beatles took two sessions to get it right, ending up with a Latin-flavoured recording with percussion by Ringo Starr and Paul McCartney. A lot of the girls were mad on him, so we always wanted to give him at least one track. Then George started to catch on: 'Why should you write my songs?' And he started writing his own. From when George first started, he would deliver one song per album. It was an option to include George in the songwriting team. John and I had really talked about it. I remember walking up past Woolton Church with John one morning and going over the question: 'Without wanting to be too mean to George, should three of us write or would it be better to keep it simple?' We decided we'd just keep to two of us. He wrote Don't Bother Me. That was the first one and he improved from that and became very good, writing a classic like Something. The mood of the song was uncharacteristic for The Beatles at the time, but negativity was a trait that reappeared in Harrison's later songs, including Only A Northern Song and Think For Yourself. Originally attempted on 11 September 1963, The Beatles returned to Don't Bother Me the following day. After recording the rhythm track, Harrison double-tracked his lead vocals, and Lennon, McCartney and Starr added percussion. Lennon played a tambourine, McCartney hit a woodblock, and Starr played an Arabian bongo. Don't Bother Me later featured in a nightclub scene in the A Hard's Day's Night film. I liked the song from the very first time I heard it. Funny, even George didn’t care for it, but if you listen to all the songs on With The Beatles it ranks right up there. I know what you mean. Its one of my favourite Songs from George. The sound is really great. i like it from the start as well. George may have written it after being sick, but a lot of us have felt the same way. Don’t come around leave me alone/don’t bother me. Thanks George. Just a feeling I have from time to times as my life goes on. Don’t you agree ? So did I. But I liked all of George’s Beatles songs from the first time I heard them. I remember the first times I heard Only A Northern Song and It’s All Too Much and wondered why they were so obscure. Great songs. VERY underated. always one of my favorite Beatle songs – regardless of who wrote/sang it – precisely because it was so out of character with their other tunes. Years later I was in a punk band and we did a cover of Don’t Bother Me – most people thought we wrote it. It was still that fresh 17 years later. 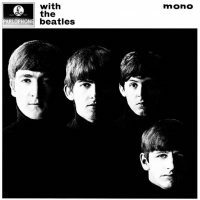 Very good effort for a first song–and I think it stacks up well against the other songs on “Meet the Beatles”. I detect some Yardbirds/Clapton influence on the song and the guitar sound George achieves. If I haven’t heard it in a while, I make a point of listening to it. This song predated Clapton’s joining the Yardbirds, and (I think) any Yardbirds recordings. The problem is that the song was written and recorded in September whereas Clapton joined The Yardbirds, who had only just started gigging, in October. Yes – George’s guitar is, as always, superb. Haunting is a good description for this first full Harrison composed song. Not sure if this is one of the songs George wrote that George Martin claimed were “dead boring”, but I was fond of it, and most of Harrison’s other songs, long before I heard what their producer felt about them. There are many qualities to Harrisongs that make them anything but dead boring to fans. I am glad Martin, McCartney and Lennon “permitted” George to have a go at singing lead and writing songs (no matter how few) for the Beatles. Harrison definitely made valuable and worthy contributions to the band that made him famous. It’s a good song, though not one of my favourites. At the same time as The Beatles release, Gregory Phillips released a single of Don’t bother me, but it never charted. I kind of wished that Ringo had sung this song in the Tribute To George Concert at the Albert Hall, instead of Carl Perkin’s Honey Don’t. I think that song would have suited him very well. You’re referring to Ringo’s refusal to give autographs, right? like everyelse I love this song .I remember in Hard Days Night it was so cool with the extra bass ,sounded great, what else could we expect from the worlds Mo 1 group . still . Is there an extra bass in Don’t Bother Me, or are you thinking of the fuzz bass used in Think For Yourself? One of my favorites on With/Meet The Beatles. Never understood why George. & the boys panned it. I’ve never understood why this song is so maligned, either. Even before the Indian influence began, George was capable of writing songs that were very distinct from the Lennon/McCartney mainstream material, while at the same time contributing greatly to the Beatles sound through his playing and harmony singing. Written in a minor mode, and having a negative lyrical message made it different than the others. The latin percussion on it adds to the uniqueness of this one. George’s doubled vocal and no harmonies also make it different than most of the other early Beatles songs. I love Georgie Boy and his songs. As someone said earlier, his comps don’t have the same mainstream sound as the Lennon-McCartney’s do. Aside from that, does anyone else hear the very faint voice at around 0:03 into the song? Also, does the song seem to get off-beat near the end around 2:16? really love the guitar solo on this one !!! Does it sound like George says ” too fast ” barely audible in the background right at the beginning of the song? It definitely does, I’ve listened to that song so many times over the years but never noticed it until I had a Tidal HiFi account with high quality headphones! Always wondered how different the world would have been if The Stones had recorded this. That would be great! The early Kinks could have done a good version as well. I don’t know what his fellow Beatles thought of George’s songwriting at this stage, but they worked very hard to make this track a good one. The instrumental backing is very rich. In fact, if possible, turn off the vocals and just listen to the backing track. It really rocks, almost like surf music! Pay particular attention to Paul’s excellent bass playing in the “middle eight”. Not at all the bad song it has been taken for. In fact it’s quite forward-looking in its use of the Dorian mode in a tonal context, the use of old Church modes which would later form the basis of most of the “Indian” influences in pop music. Yes, not only the use of the dorian mode, but the almost entirely pentatonic melody, except for the single highest and most dramatic high F# . Besides, we can hear another rare feature, the fourth chord both in major and minor, A and Am, in different parts of the song´s structure. Excelent guitar solo, nice lyrics, it´s a real pity that they never performed it live. Very interesting for the first ever George Harrison song ! I love this great tune from the very beginning way back in the sixties…and still remember many things reflecting through this song in my heart…Thank You, George! Groovy song! Especially for a first go. Lennon-McCartney’s VERY early (pre-Beatles) songs aren’t even this interesting. And why do I find a grumpy George glowering out from beneath his [admittedly] tufty eyebrows so appealing? Right You are, Silly Girl! I do almost the same…This song helps me to overcome some moody vibrations in the air and what is more even different unpleasant things…It’s really true! Good lyrics, different for the time. Shows George’s character. Great George Harrison number. As “Golden Slumber” said they are good lyrics and different for the time. Also it is a insight to part of George’s character as the before mentioned person said. Also love his voice and lead guitar on this. A gem on the wonderful “With the Beatles” album, which was a real step forward developmentally as whole for the band. I have listened to that song more now; and appreciate the guitar tones and the bass playing is fantastic; that song can not be improved too much; they used the technology of the time and made the best of it. It has its own seal, indeed. Sounds quite different from the Lennon-McCartney tunes. Guitars and bass, should they have recorded them with a more modern equipment, would have given a primitive heavy distorted sound. Not a bad one from George being his first one! Very underrated song, and an incredible first offering from George. Musically and lyrically unlike anything they had done to date, and I would argue that along with All My Loving, it’s right there with It Won’t Be Long, and Not A Second Time as the Beatle composed gems on With The Beatles. Miles ahead of Little Child, and Hold Me Tight. Never understood George thinking this was a bad song, but the writer does not often have the most objective view of his work. How many of us would love to be able to write a song this “bad”? Throughout his songs George brought a perhaps much-needed dark (negative, sad, angry, disillusioned) side to the otherwise upbeat happy pop sound of the band which I am sure helped them identify with the people and better capture the spirit or zeitgeist of the times. In addition to the aforementioned songs after Don’t Bother Me he went on to write If I Needed Someone, Taxman, Within You Without You, The Inner Light, Blue Jay Way and While My Guitar Gently Weeps, all of which have some negative element. I love how he even applies his dark sense of humor to the high energy song about sweets by saying “What is sweet now turns so sour” and “You’ll have to have them all pulled out after the Savoy Truffle”. (Wow! Take a sweet song and make it sadder). So he did pen the perfectly positive (though a little melancholy) classic Something, and one could say that The Inner Light and Within You, Without You are more about enlightenment than they are about being disillusioned but I think anyone would be hard-pressed to find any song written by George that didn’t express some form of negativity. Nevertheless, I am sure we all agree that he was a perfect fit, a wonderful singer, songwriter and guitarist and he expressed his honesty, love and sorrow in a way that was fab. My favorite audio clip from “Hard Days Night” movie without a doubt. Always liked this one. A bit different from the Lennon/McCartney songs of the day – moody, in both melody and lyrics. I never understood the downplaying of this song by George H. or the others.